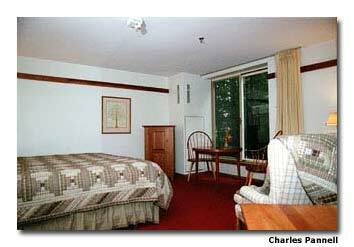 Room 107 at the historic Harraseeket Inn features good access and quaint New England charm. Let’s face it, when it comes to finding wheelchair-accessible accommodations, most people don’t even consider inns and B&Bs. The truth is many folks think these properties are inaccessible. Maybe it’s because innkeepers don’t readily promote their access, or maybe it’s just because we’ve seen way too many photos of historic inns with nary a ramp in sight. No matter the reason, most wheelchair-users overlook this unique lodging option. Ironically, inns and B&Bs can be the ideal choice for people with disabilities. In fact, many innkeepers have added accessible guest rooms or made other access modifications because they have friends or family members who are disabled. Additionally, innkeepers are intimately familiar with the access features of their property, and guests are guaranteed the specific (accessible) room they reserve. Room 121 at The Inn at Honey Run has excellent pathway access and a great view of the adjacent woods. This isn’t always the case in large hotels, where access requests are sometimes lost in the shuffle and reservation clerks are clueless about access modifications. Indeed, sometimes access needs are more adequately addressed at smaller properties. 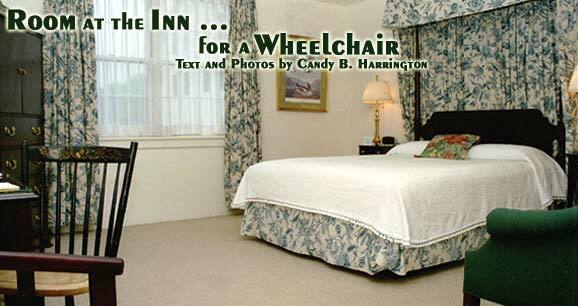 With that in mind, here’s a sampling of some accessible inns and B&Bs across the United States. First stop, the Victoria Inn, located in historic Murphys, California. Formerly the Redbud Inn, this classic country property combines quaint charm with modern accessibility. Mae’s Room, located on the ground floor, features a comfortable queen-size bed, plus a spacious tiled bathroom with a roll-in shower, a roll-under sink, and grab bars around the toilet and in the shower. There is also barrier-free access to all ground-floor public areas, including the breakfast room and parlor. Quite a surprising find in this restored California Gold Rush town. Located in the heart of Ohio Amish country, The Inn at Honey Run is another surprising find, both in terms of access and ambiance. Far from your typical Amish inn, this unique property features sleek contemporary lines in a natural setting. Room 121 has excellent pathway access and a great view of the adjacent woods, and it includes an oversized bathroom with a roll-in shower and two shower seat options (a chair and a bench). Indeed, an innkeeper’s attitude can make or break a property, at least as far as access is concerned. Take innkeepers Anita and Ken McLeod of Las Cruces, New Mexico, for example. Their proactive access attitude actually predates their inn-keeping days. As the result of knee surgery and arthritis, Anita walks with a cane, so she is keenly aware of access obstacles. Mae’s Room, at the Victoria Inn, features ground-floor access and a spacious bathroom with a roll-in shower. “Throughout our travels, I came to realize that many so-called accessible rooms are actually pretty poorly equipped,” says Anita. Because of this awareness, Anita and Ken designed their Dream Catcher Inn to be as accessible as possible. Located just outside Las Cruces, the Dream Catcher Inn features three guest rooms, all of them wheelchair-accessible. 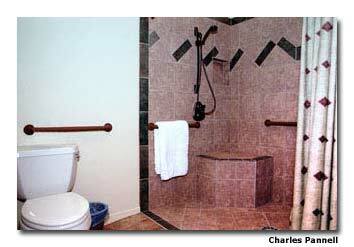 Rooms 1 and 2 each have a roll-in shower with a built-in shower seat, while Room 3 has a jet tub with grab bars. All areas of the inn feature level access, wide doorways and barrier-free access. Indeed, it’s very nicely done, access-wise. And last, but not least, if you’re longing for the ambiance of a traditional New England inn, then check out the Harraseeket Inn in Freeport, Maine. This historic inn includes two period buildings that were built in 1795 and 1850, plus a new wing that was added in 1989. Today the restored property includes two accessible guest rooms, Room 107 and Room 204. Both rooms feature a level entry, wide doorways, lowered closet rods and good pathway access. Room 107 includes a bathroom with a tub/shower combination, while Room 204 has a bathroom with a roll-in shower. There is good access throughout the public areas of the inn, including an indoor pool equipped with a pool lift. Innkeeper Chip Gray thought of everything as far as access is concerned, including an ample selection of disability focused magazines in the library. Now that’s really accessible! So next time you’re looking for an accessible room, consider an inn or a B&B. Remember, more often than not, there really is (an accessible) room at the inn! 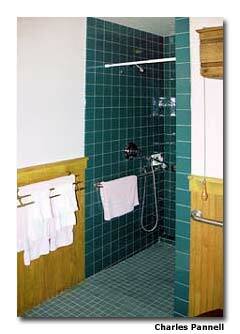 Rooms 1 and 2 at the Dream Catcher Inn have a roll-in shower with a built-in shower seat.